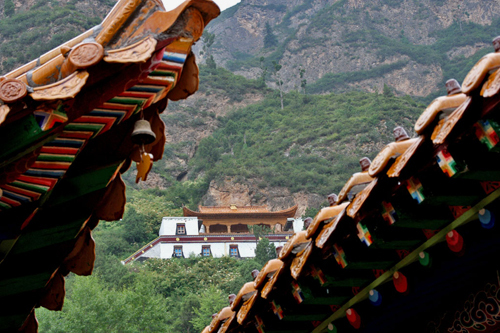 Tucked away in a steeply forested valley, Youning Si (Rgolung in Tibetan), a monastery belonging to the Gelugpa order (or the Yellow Hat Sect), is a fantastic hidden gem and makes for a great day trip from Xining. The setting is gorgeous: a couple of large, colourful monasteries that line the road up the valley mark the beginning of the pilgrims’ trail. 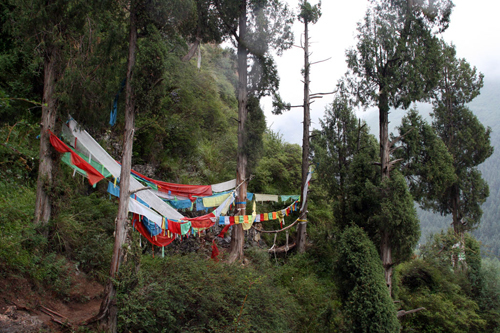 From here, gaggles of pilgrims climb up the steep paths, half-smothered by lush vegetation and covered in prayer flags, which skirt the flanks of the mountain and lead to a scattering of small chapels and shrines, perched high on the hillside, their golden roofs gleaming from the distance. On rainy days, such as the day of our visit, the muddy paths can get quite treacherous. Needless to say that the pilgrims, including the frail old grannies and small toddlers, skip along the trails, ignoring the hairy bits. We on the other hand, with our clumsy feet and exaggerated fear of heights, held everybody up as we hesitantly negotiated the steepest parts. 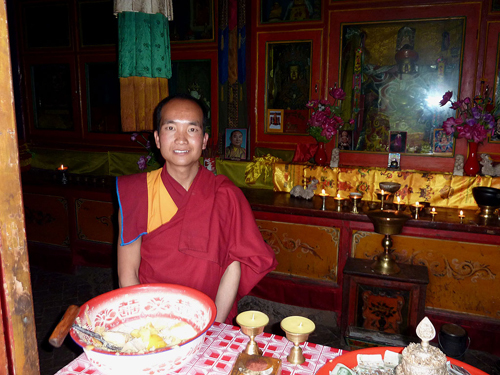 At first sight, Youning Si could easily be mistaken for a typical Tibetan Monastery: the 200 or so shaven- headed monks (there once used to be 7000) wandering around in dark red robes, the temple decoration, the images of the deities, the photos of famous Lamas that adorn the altars, are all just as you would find them in any Tibetan monastery. 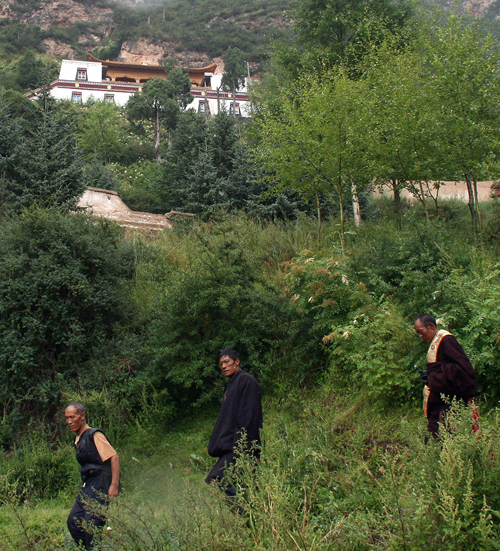 The monks were curious to see and speak to foreigners and seemed remarkably well-informed, given their isolation. One of them asked about how we choose our politicians in Europe (I actually think he knew the answer), and then expressed his regret that in China they couldn’t choose. We continued to debate the strengths and weaknesses of democracy and dictatorship for a while. We then moved on to the topic of restoration. It was clear that Youning Si was receiving funding (from abroad?) for restoration and re-painting. I suggested that the monastery should perhaps provide some accommodation, as there is plenty of scope for further exploration and nowhere to stay at the moment. Our interlocutor thought this was a very good idea and recommended some other monasteries, further up the valley, that were also worth a visit. 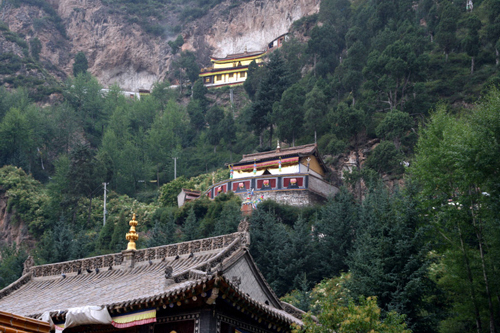 Visiting Youning Si will give you a completely different experience from visiting the much more famous Kumbum monastery, also near Xining. 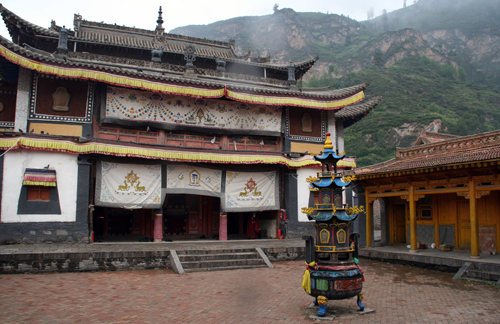 It is true that Kumbum is much larger and houses many important relics, such as statues, paintings or thankas, but at the same time a combination of hordes of tourist visitors, commercial exploitation and strict government control has given it a somewhat sterile feel, devoid of the spirituality it must once have had. We spent nearly two hours exploring Youning Si but, if it hadn’t been for the sometimes torrential rain, we could have spent longer. The monasteries, chapels and shrines may be interesting rather than spectacular, but what they lack in architectural and artistic treasures, they make up for in ambience, charm and setting. We took a bus from Xining’s main bus station to the sprawling town of Ping’an, just under an hour. From there, we hired a taxi for 150 Yuan, including waiting time, for the 30 minute ride to Youning Si. For the latest on Youning si click here or read the comments below: There maybe some problems getting there. Huzhu Tu Autonomous County is closed to foreigners. Visiting without a travel permit or in the company of a travel company can result in punishment. Really! We visited Youning Si in August this year. Nobody said anything to us and nobody at Youning Si seemed surprised to see us. There were no police checks and the taxi driver in Ping’an told me that he had taken quite a few foreiners there. Wow, great pictures. I’m hanging on every word, I want to make the same trip in a year or two. Yes, it is closed. Though we were sold tickets in Xining, we were approached by police in Weiyuan and first threatened with a fine and arrest before being told to simply return to Xining. Maybe you can go legally if you go through a travel agency. We didn’t have time to try that. 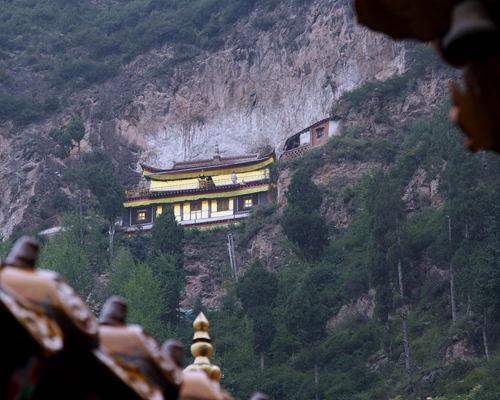 Huzhu County is most surely closed to foreign travel. Today I was there, a bad rainy day, what a pity for the photos! A great place, nothing to admit. Problems to go there? I cannot imagine. I met an Australian guy with a chinese guide from Xining. Myself was carried there by chinese friends. They didn,t know the place before and had to ask a lot to find it. 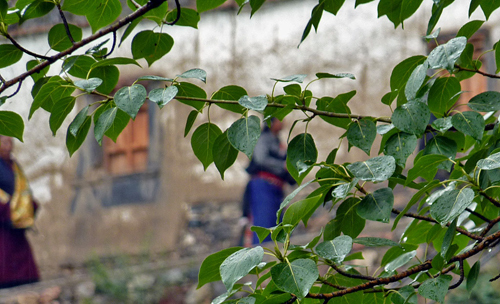 We made a round tour by Huzhu, crossed two mountain ranges to find the place, and returned by Ping,an. I cannot reconstruct our way on Google Maps. It would be helpful if anybody could give a better description.